4/17/2002 Downloads Page : Two new video clips. 4/1/2002 Publications Page : Added GDC paper and talk slides. 3/23/2002 New Downloads Page with SkyWorks cloud rendering demo. We use hardware blending and read back to pre-compute multiple forward scattering and transmission of light through the cloud. phase function. 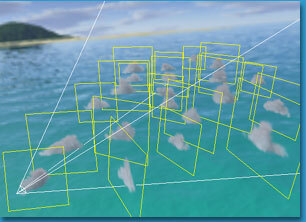 Then we render the shaded and modulated particles as textured splats. Clouds exhibit strong multiple light scattering dominated by scattering in the light direction. Light scattering in clouds is more intense in directions toward and away from the light source. By modulating particle colors with ananisotropic phase function, clouds achieve the characteristic "glow" shown in the top image. The bottom image shows the uniformity of clouds shaded with a purely isotropic scattering phase function. We use impostors to accelerate cloud rendering. 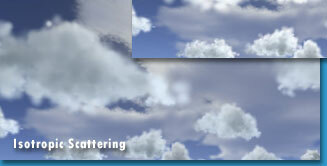 An impostor replaces a cloud with a billboard textured with an image of the cloud from a certain viewpoint. The image is updated only when translation of the viewpoint introduces enough error in the image to	make it invalid. 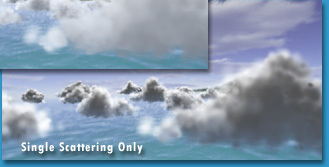 Impostors allow the rendering of a cloud to be reused for many frames. By using impostors, we are able to render cloudy scenes of hundreds of clouds and hundreds of thousands of particles at very high frame rates. We render aircraft passing through clouds by using "impostor splitting". The images to the right demonstrate this process, progressing from bottom to top. First, we render the portion of the cloud that is farther from the viewpoint than the airplane. Next, we render the airplane on top of the far portion. Finally, we render the portion of the cloud that is closer to the viewpoint than the airplane.